Welcome to St. Valentine’s Web Site. As a faith-filled community located in Redford Township MI, we celebrated our 70th Anniversary as a parish in 2017. Fr. Socorro Fernandes, SAC, is our Pastor, Fr. Kishore Babu Battu, SAC is our Assistant Pastor, and Deacon Lawrence Toth is our Deacon. I had the esteemed honor of attending the now famous Synod 16 as a member of St. Valentine’s Parish. The three days were packed with so much it is hard to give you an adequate summary without taking multiple pages. I encourage you to go to the Michigan Catholic on line, November 25th edition, or the Archdiocesan website: www.aod.org for well written and captivating video portrayals of this historical event. Throughout the preparation period and at the Synod itself, many themes surfaced. We were to find ways that would “change the DNA of the Archdiocese,” to “Unleash the Gospel “ and to encourage all of us to “become joyful missionary disciples,” professing the saving Love of Christ to all in southeastern Michigan. At our first gathering of the Synod, we soon felt in our souls that these were not mere slogans. More than 400 Catholics processed outside singing Come Holy Ghost, in public streets along Washington Boulevard. During the ensuing mass at the magnificent St Aloysius Church, the fervor, and the intensity of the congregation was impressive and palpable. Something very different was happening here. Certainly the Holy Spirit was upon us and remained with us as we spent three days praying, discerning, discussing, evaluating, and prioritizing goals that will allow us to actualize the message in those themes. It was equally inspiring to witness members in all 6 of the AOD counties share similar deliberations and conclusions despite our diversity. A pastoral letter from Archbishop Vigneron will likely be given during Pentecost 2017. What do we do until then? Well, one thing for sure that we should not do, is be a passive observer in our pew. It is time to change our own DNA, NOW!! As one synod members aptly said, “The challenge for the individual is to be a faithful Catholic, a committed Catholic, to be something worth sharing.“ To paraphrase a famous quote: ask not what God can do for you, but what you can do for GOD. Thank you to all who prayed for us during the Synod. We are asked to continue praying for the success of Synod 16 and, if I may add, pray for the rebirth of us, the individual, as the Holy Spirit continues to guide us. There are personal pictures from the event on our church bulletin board in the main vestibule. 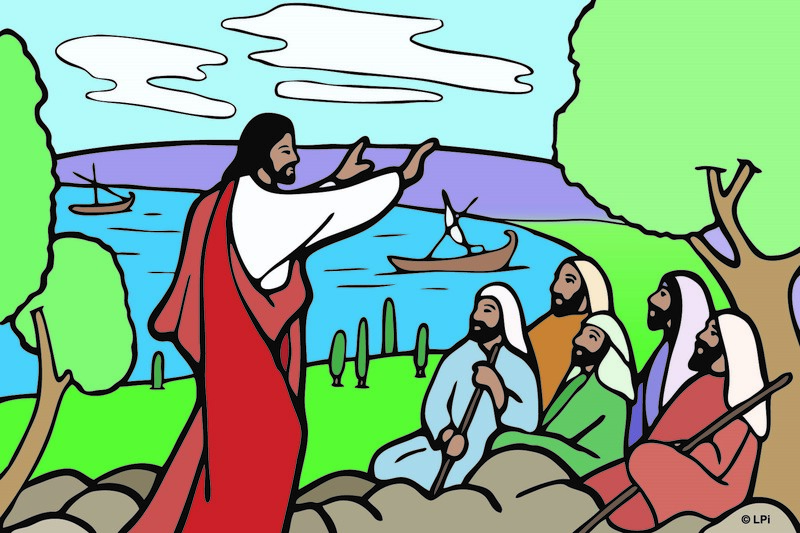 God our Father, you have called us to be witnesses to Jesus and have sent us on a mission to lead all people to encounter him. Send you Holy Spirit to enlighten our minds and enkindle our hearts, so that we may grow daily as your disciples. Empower us to face bravely the challenges of our time. Keep us close to you, together with Jesus your Son, Mary our Mother, and St. Anne our patroness as we engage in Synod 16 to Unleash the Gospel. Transform us into a band of joyful missionary disciples, who will bring the message of Jesus’ power and mercy to every person in Southeast Michigan. We ask this through Christ our Lord, Amen. Monday, Tuesday & Thursday – 8:30 am in the chapel. Friday – 8:30 am in the Church. 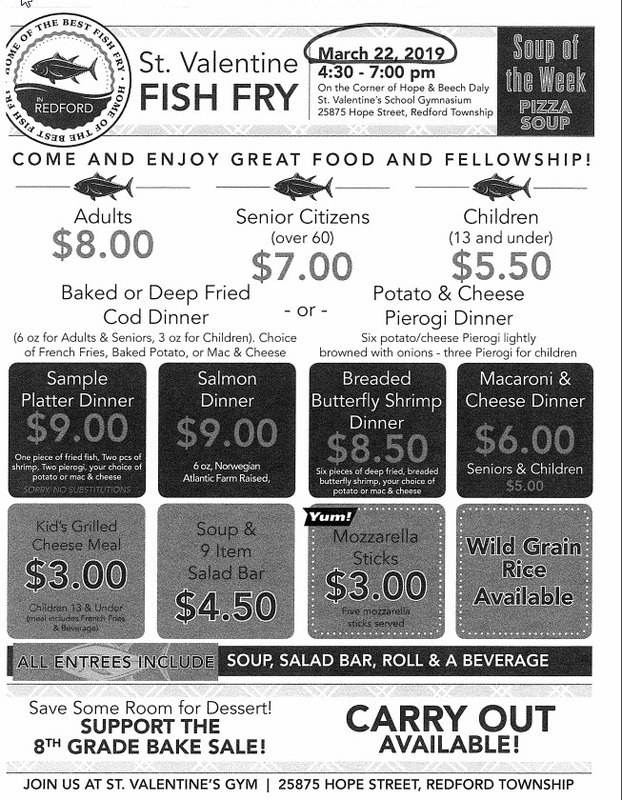 St. Valentine Lenten Fish Fry menu and info available here. For the best food in town, check us out! Miss the Michigan Catholic newspaper? Detroit Catholic, a digital news service of the Roman Catholic Archdiocese of Detroit, is the successor to the archdiocese’s longtime award-winning official newspaper, The Michigan Catholic, which was in operation from 1872 to 2018. You can find Detroit Catholic on the WEB at DetroitCatholic.com and also at the social media account @DetroitCatholic on Facebook, Twitter, and Instagram. All sites are updated daily with content from our local producers, columnists and partners reporting on Catholic news and events, both locally and across the globe. Learn more about the Mass through this online video series of 31 Episodes on the various parts of the Mass. RCIA, or Rite of Christian Initiation of Adults, is the process by which people who are interested in learning about the Catholic Faith can attend classes and have the opportunity to become members of the Catholic Church. RCIA is a spiritual formation process scheduled to begin in October. To register, or for further information, please contact Fr. Henry at 313-8532-4394 x102. FORMED is a digital gateway to the best Catholic content, teachers and presenters, accessible anywhere at anytime on most smartphones, tablets and computers, for catechetical training, study groups or personal growth. Call the rectory for login information.